Participation Cymru’s blog has now moved! Please visit http://participation.cymru/en/blog to read our latest posts. If you were a subscriber here – don’t worry, we’ve automatically moved your subscription over to our new website. This entry was posted in Uncategorized on April 7, 2017 by Participation Cymru. The most recent North Wales Participation Network was held as part of a wider event – the Festival of Behaviour Change which took place in Pontio, Bangor University and was organised in partnership with Wales Audit Office and Good Practice Wales. Each participant had 3 ‘game cards’ inside the delegate pack that was given out upon arrival. Each card either represented ‘easy’, ‘medium’ or ‘hard’ and had a list of challenges to complete throughout the day. When you complete a challenge, you get a stamp on your game card and a completed card wins a small prize. I used a step-counter app on my phone to keep track of my footsteps (I’d already walked to the venue so was over half-way towards the target before the event began), they had pedometers available too. I also intended to use photos as proof for recognising positive things that happened – the sun was shining, our network event was very well attended and we had an excellent discussion – I sadly didn’t gain the stamp for this challenge, as I was busy facilitating the network event and only had a chance to take 1 photograph so missed out due to lack of evidence! In order to join with another group, there were various colours of wristbands in our delegate packs – 4 different colours in total. This could be proved by taking a photo of the different coloured wristbands. To prove you attended all the events in one day, after leaving a session the participants who were playing the game could get a stamp for their card. Although I didn’t gain every stamp in order to win a prize, this activity was a very fun way to participate in addition to the interesting sessions taking place as part of the festival. This technique is incredibly motivational if you apply it to your everyday life. There is a website and mobile app I’ve discovered called Habitica which turns your life into an RPG (role-playing-game). You set your own tasks and goals, rate their difficulty and when you complete them your character is rewarded! Be warned, if you don’t complete your tasks, this will harm your character’s health and you will have to work harder to bring it back up again. The game was to use the stickers provided to identify your random acts of kindness. The aim of this game is to create a positive experience for everyone. Small, simple and commonly spontaneous acts of kindness, often performed to strangers, have been shown to significantly increase feelings of happiness for both the giver and receiver. Additionally, consciously reflecting upon such acts is linked to a reduction in negative emotions and is thought to enhance an optimistic outlook. Research has shown that random acts of kindness can be an effective way in which to enhance your social and emotional wellbeing, which is further connected to relationship skills, responsible decision-making, self-esteem and self-awareness. Have you used any gamification activities with service users, or have you used a gamification app for personal behaviour change goals? Why might random acts of kindness work for you? Please let us know in the comments below and join our discussion. This entry was posted in Networks, Participatory methods, Uncategorized and tagged Bangor, behaviour change, citizen engagement, engagement, gamification, Good Practice, information, Kindness, networking, North Wales, participation, Positive changes, Positivity, Random acts of kindness on June 9, 2016 by Participation Cymru. In the Participation Cymru team we love spending time outdoors and the opportunity of holding a network in the open air is an idea we’ve thrown around for a while. Firstly, the weather was absolutely glorious! Tom started the fire earlier that morning, so hot tea and coffee was served upon arrival. Jill Simpson, from Pembrokeshire Coast National Park showed us this beautiful, tactile piece of community made woodland furniture (it’s so much more than just a bench) that was designed and created by local young people. Matt, a volunteer for Pembrokeshire Coast took us for a walk along a bridleway where we learned map reading and basic orienteering skills. Our mid-morning snack: warm bread fresh from a Dutch oven with freshly picked wild garlic. We used a participatory voting method – ‘pebble voting’ to decide which of the teas tasted the best (dandelion seemed to be the most popular). We recently published a checklist of implementation for the National Principles with questions relating to each principle. Has your organisation had to change its behaviour when engaging? Have you had to try to influence the behaviour of others in order to make improvements? Join the conversation but leaving a comment below. This water soluble air-drying clay is an excellent way for people to ‘leave their mark’ in nature without causing any damage to the environment. We took all of our rubbish with us. Many thanks to Tom, Jill and Matt from Pembrokeshire Park National Park Authority who helped make this event a success. Are you thinking of holding a community event or meeting outdoors in Wales? If you are, please tell us so we can help you promote it. Keep checking our website for details of future network events. Our ‘All Wales Network event’ entitled ‘Engaging with diverse communities’ is taking place in Llandrindod Wells on 14th July it’s FREE to attend! This entry was posted in Networks and tagged behaviour change, citizen engagement, engagement, facilitator, Good Practice, information, nature, networking, networks, participation, participation cymru, wales, woodland on May 19, 2016 by Participation Cymru. What makes an engaging presentation? Presentations created using PowerPoint have been a large part of the business world for the past 20 years. A presentation is a speech that’s meant to inform, persuade or build good relationships; the slides that appear behind the speaker are there to compliment their words. The concept of presenting in this style is here to stay, but why do traditionally styled presentations seem so boring these days? Generic, clichéd images of integral cogs, smartly-dressed people standing over a monitor or a classic ‘thumbs up’. All of these common features seen in presentations have helped coin the phrase ‘death by PowerPoint’ . The BBC’s article How to avoid ‘death by PowerPoint’ lists some of the overused and almost cringe-worthy clichés that you’ve quite likely had to sit through with stifled yawns at some point during your life. Before you start designing slides, you need to recognise your own presentation style or rhetorical stance, identify the purpose of your presentation and most importantly: the needs of the audience you’ll be presenting to and how to get the message across in an understandable, engaging way. Do you even need slides or will your words be sufficient? If you do opt for slides there are many alternative types of software to try if you want to avoid using traditional PowerPoint in your future presentations, there’s Prezi which is quite widely used – its key feature being its zooming user interface which allows you to zoom and rotate into each slide, but try not to overuse this feature. There’s also Keynote for Mac and iOS. The latest version of Microsoft PowerPoint also has some exciting features such as its slide designer and 3-D animator. One of my personal pet peeves with presentations is when the slides repeat – almost word for word – exactly what the presenter is saying. My personal choice is for there to be as few words on a slide as possible (preferably none at all). The photographs you choose as your backdrop will help set the tone for the point(s) you’re making so, whilst avoiding the clichéd thumbs up and cogs, this is also an opportunity to get creative with your visual content; find a free stock photo using Pixabay, create an info-graphic using Easel.ly or Canva or even take your own photographs to accompany your presentation. Any form of presentation or public speaking requires you to perform and adopt a persona, mostly because it’s a daunting task and even the most experienced of public performers will get nerves – this is completely normal. A good idea is to concentrate on your body language – social psychologist Amy Cuddy’s research shows that by standing in a posture of confidence can affect certain neurotransmitters in our brain and have an impact on our chance of success, even if we’re not feeling particularly confident at the time – the important thing is to act confident. If you’re passionate about the topic you’re speaking about then this will show. Steve Jobs says “Be authentic: don’t let the noise of other’s opinions drown out your own inner voice” – get inspired by your topic in order to inspire your audience. We recently held a training course ‘Designing and delivering brilliant presentations’ with the aim of developing skills in creating and delivering presentations that will make a real difference. The learners will also have a chance to design their own presentation and attend a follow-up session with their fellow learners, deliver their presentations and gather feedback. We can also deliver this course in-house for organisations; get in touch to discuss your learning needs. Have you got any other tips for designing or delivering presentations? Please leave a comment below to share your ideas and experiences. This entry was posted in Training and tagged engagement, information sharing, Powerpoint, presentations, Prezi, technology, visual engagement on February 8, 2016 by Participation Cymru. As well as being Participation Cymru’s Adminstrator, I am also the lead on the protected characteristics of pregnancy and maternity under the Equality Act 2010. I am the proud mother of a lovely one year girl and was adamant from the start that I wanted to return to work, largely so that she would grow up knowing that she does not have to choose between a career and a family, and so this topic is close to my heart. I considered myself fortunate during my own pregnancy and subsequent maternity leave to be working for an organisation that treats pregnant employees fairly – in fact I disclosed my pregnancy during my job interview and was not hindered by this! I chose to take six months of maternity leave and was able to fully appreciate and use this time to bond with my daughter in the knowledge that my position at work would be secure at the end of my leave. Moreover I was only contacted socially by my team during my leave and was given support and supervision on my return to help me get quickly back up to speed with things. My own situation should be considered the norm and not an example of good fortune. Unlawful discrimination against pregnant employees is well documented however, and every year many women have very different experiences to the one I described. One in nine new mothers are discriminated against or dismissed from their employment in the UK. While men are often seen as more responsible at work when they become fathers and can benefit from increased responsibility or promotion, women can and do suffer from being perceived as less capable and less reliable when they become mothers. This is not only an unfair assessment of the abilities of individual women in their careers (not to mention the contribution of fathers) but also damages workplaces if talented women choose to leave. Co-workers were sympathetic about asking me to attend meetings that were far from home or had a very early start. I recently attended the All Wales Maternity Network, a forum for service users to contribute to the improvement of maternity services in Wales. During the introduction I learned that most changes to these services have come about as a direct result of challenges by service users – our right to give birth in a hospital and to have access to an epidural are a result of demands by mothers. While it was certainly positive to be part of a meeting of parents and professional (most people present were both) who were determined to improve maternity services, the number of people who shared distressing experiences that could have been avoided was disheartening. One common frustration that emerged was that mothers felt that they had not been provided with enough information to feel that they were making informed, empowered choices about the options available to them regarding where and how they chose to gave birth. Further to this many women were unaware that they had a choice in certain matters – the language used by some health visitors and midwives implied that these women were being instructed instead of advised and there was no opportunity for discussion. These issues are equally relevant for mothers choosing to return to work – if we are to insist on fair treatment it is imperative that we know what our rights in this area are. Find out more about how to get involved with Maternity Network Wales. This entry was posted in Equality, Networks and tagged equality, maternity, networks, pregnancy, wellbeing on December 8, 2015 by Participation Cymru. If you’ve never come across the concept of Open Space Technology before and you’re familiar with a formal style of hosting meetings, it can seem quite daunting to have to facilitate or even participate in a session that uses Open Space. Our ethos is that ‘We work with people and organisations and not for them’. Open Space Technology is a style of facilitation that allows a group of individuals to be completely self-organised in reaching goals. 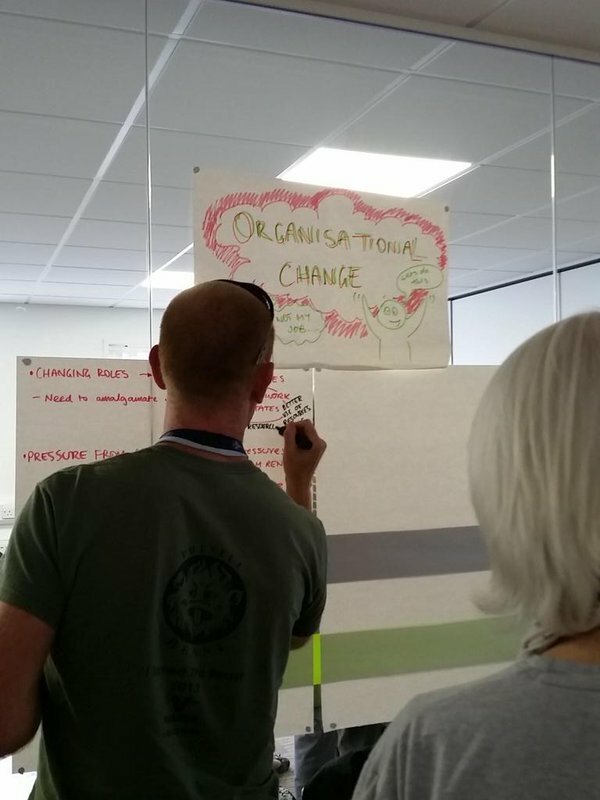 This is achieved with barely any input from the facilitator, who will do little more than outline the guiding principles of Open Space Technology, introduce the over-arching topic/theme/purpose of the meeting and then let the group get on with it. This technique has been used around the world in meetings of 5 to 2000 people. Owen’s Tedx Talk ‘Dancing with Shiva (or Sandy, or Katrina)’ is a great starting point for any facilitator or practitioner interested in this method. We’ve used this technique several times including at our All Wales Residential Network in 2012, during a session at WCVA’s annual staff day and most recently at our Regional Participation Networks in October. This technique is excellent because it really allows anyone who attends a session to speak about what they want. Open Space gives people a platform to do this without a facilitator poking their nose in (as it may be perceived) if a conversation goes off-topic or a discussion changes course, therefore shifting the power away from one person and sharing it amongst a group. Home or hospital – what is better for patients and staff? There is a huge online community for facilitators and practitioners who use or are interested in Open Space Technology, which includes a very active e-mail discussion list and a Google Group – no organisation or individual owns or controls this collective information and it truly is an ever-expanding knowledge-base. I’ve been part of the e-mail discussion list for just over a month and although I haven’t contributed anything, during my time spend ‘lurking’ I have learnt so much about situations where Open Space has been used successfully. Anyone can read the archives from this list, which date back almost 20 years so there is a huge amount of user-generated information there! As a facilitator, it’s great to look around the room and observe meaningful, organic and productive discussions which are taking place. As a participant, it’s wonderful to have the opportunity to talk about things in an informal environment. Even with careful facilitation with lots of open questions asked it can still be difficult to get your point across if other participants have a louder voice than you. In an open space environment, participants can use the law of two feet to move away from unproductive discussions. Have you ever used Open Space Technology in your engagement work? Have you ever attended a session? Please share your experiences in the comments section below. This entry was posted in Networks, Participatory methods and tagged Facilitation, facilitator, Meetings, networking, networks, Open Space Technology, participatory methods, Public Engagemen, staff engagement on November 17, 2015 by Participation Cymru. I recently attended a meeting of the Patient and Public Interest Group (PAPIG), which is made up of patients, carers, patient advocates and third sector organisations. The group feeds their views via the All Wales Therapeutics and Toxicology Group (AWTTC), who provide professional, technical and administrative support to the All Wales Medicines Strategy Group (AWMSG). One of the roles of AWMSG is to advise Welsh Government whether new medicines should be available for use in NHS Wales. which patients they would benefit the most. AWMSG is committed to involving patients, carers and members of the public when evaluating new medicines. During the appraisal process, the patient and carer view is critical because clinical data alone can’t quantify a patient experience – the patient needn’t be an expert in medicine in order to be involved in this process. Most of the questions asked of them during the appraisal process are related to their condition and how it affects their day to day life. The patients and carers who contribute may not be scientifically or clinically trained, but they certainly hold invaluable knowledge about the impact that their condition has on their and their families’ lives. Other stakeholders such as pharmacists, academics, clinicians and industry representatives are also involved throughout the process. The patients and members of the public are found through patient advocates and third sector organisations that are represented on Patient and Public Interest Group. AWTTC also search for other patient groups in order to reach those who are not currently engaged in this process. It’s worth noting that other bodies in the UK who appraise new medicines do not take responses from individual patients or members of the public, but AWMSG do. Patients and members of the public who are involved are known as lay-members. The dictionary definition of a lay-member is “A person who does not have specialised or professional knowledge of a subject.” So if this is what a lay-member doesn’t have, what about the skills that they do have? 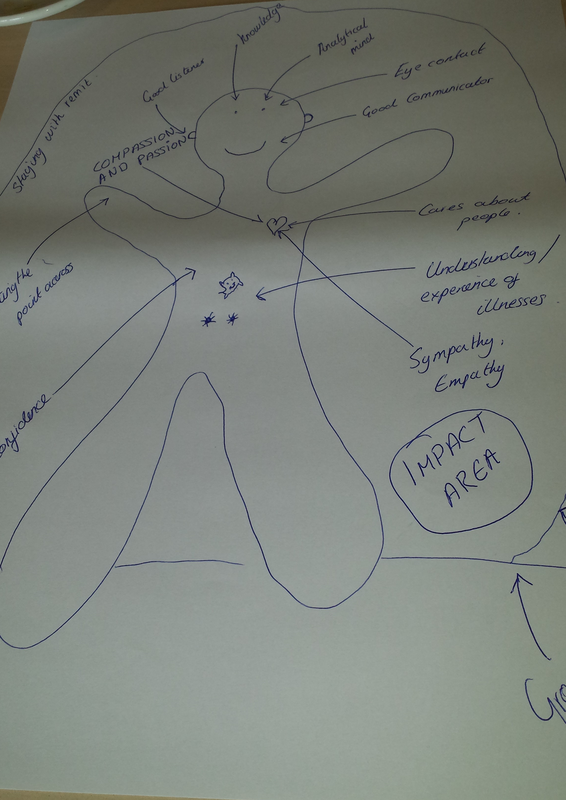 Completing this visual exercise was very a thought-provoking and interesting way of looking at the lay-member role. What participatory tools have you used to analyse the roles of citizens involved in your consultation process? This entry was posted in Citizen's voice, Participatory methods and tagged citizen voice, health, medicines, participatory methods, wales on November 5, 2015 by Participation Cymru.